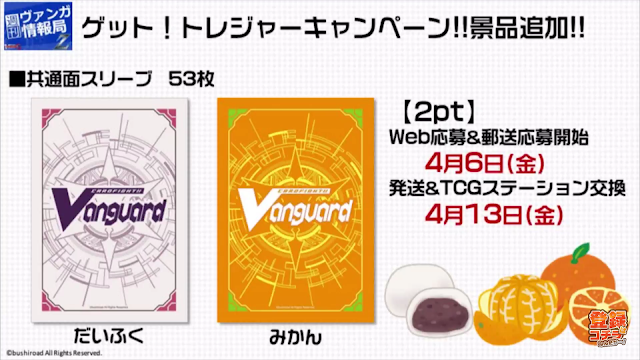 In the 26th episode of Weekly Bites Z, host Doctor O revealed that April will see the launch of two new card sleeves for the Cardfight!! Vanguard TCG. The first is the white-and-purple "Daifuku" sleeve, inspired by the bean jam-filled rice cake of the same name, and the second is "Mikan," inspired by the Japanese orange. The sleeves are a follow up to the previously-released "Mint Chocolate" and "Strawberry" sleeves, launched back in late 2017. They are available solely through the Get! Treasure Campaign, a promotional campaign in Japan where fighters can exchange tickets packed into booster packs and boxes for limited edition items. These will be available for exchange online beginning April 6th, and at through shops beginning April 13th. Overseas fighters will have to buy them secondhand; typically GT Campaign items resell for $13~20.